Connolly was born in Scotland in 1868. The son of Irish immigrants, he spent his childhood in the Cowgate area of Edinburgh; then an Irish slum. He attended the local Catholic school until just before his 11th birthday, whereupon he joined the ranks of the army of child labour that formed the lowest tier in the support system of the Great Industrial Empire. By the time he was fourteen, Connolly sought escape from the poverty of the slum and – lying about his age – joined the British army. How different would history have been had Connolly’s regiment not been posted to Ireland? For the next seven years James Connolly was a British soldier in a country on the brink of revolution. A country he’d been raised to call his own, despite his thick Scottish accent. They were formative years for the young Connolly. Years in which he first encountered Irish nationalism, Karl Marx and Lillie Reynolds. He was to devote the rest of his life to all three… deserting the army, marrying Lillie and becoming a revolutionary firebrand. Critics of Connolly have often argued that he gave his political activism a higher priority than his family. But the unwavering and vocal support he received from Lillie, and later from his son Roddy and daughter Nora, who became a revolutionary socialist herself, tell a different story. Those closest to James Connolly shared his passion for social change and saw in him a man who might just be capable of bringing it about. And bring it about he certainly did. No, he didn’t usher in the international socialist revolution he wrote about, but by aiming so high and urging so many others to do the same, Connolly brought radical social change to Ireland and was cited as an inspirational figure far and wide. Including by none other than Vladimir Ilyich Lenin. Apart from his primary school in Edinburgh, Connolly was a self-educated man. He had a reputation as a prodigious reader and consumed books on political theory from all points on the spectrum. But it was the work of Karl Marx than chimed deepest with him. Connolly fervently believed that no human being should be forced to endure a lifetime of poverty and while he never truly escaped it himself, his activism paved the way for the Irish working class to begin the long climb out. He spent a few years back in Scotland after deserting the army and became involved in left-wing politics, founding The Socialist newspaper. But it was when he was offered a position as secretary to the Dublin Socialist Club in 1895 that his political activism really took off. Within months of returning “home” to Ireland, James Connolly had transformed the Dublin Socialist Club into the ISRP (Irish Socialist Republican Party), a small but hugely influential group that was to become the template for future Irish socialist parties. Publishing the nation’s first regular left-wing newspaper, Workers’ Republic, the ISRP embodied the ideals of socialism and republicanism that were to inspire Irish revolutionary socialism for generations to come. Connolly believed in Marx’s vision of international socialism. At the same time he remained an Irish nationalist, convinced that Ireland could never be part of an international revolution until it had thrown off the shackles of imperialism and taken its place among the community of independent nations. In 1903 he was invited to give a series of lectures in New York by the Wobblies (the Industrial Workers of the World). His pamphlets had made their way around the world and had met with acclaim from Marxists, labour unions and socialists. His stay in America ultimately lasted seven years. Active within numerous socialist groups and founding one or two himself, Connolly learnt much from his involvement with the American labour union movement and upon his return to Ireland in 1910, was in a militant mood. With his friend and fellow-traveller “Big Jim” Larkin, Connolly helped set up the Irish Trade Union Congress. Larkin was a revolutionary syndicalist and had formed the Irish Transport and General Workers’ Union – by far the most militant Irish labour union and a pivotal organisation in the Dublin Lockout. Together the two men set about planning a workers’ revolution in Ireland and formed the Irish Labour Party to help bring it about (oh, how that once mighty organisation has fallen!) In 1913 Larkin called a General Strike and the Dublin Lockout began. Initially picketing and agitating for better pay and conditions, the Lockout turned nasty when the Dublin Metropolitan Police were ordered to break the strike by any means necessary. Violent clashes erupted and Connolly responded by forming the Irish Citizen Army. Initially created to protect workers from the increasingly brutal police attacks, the ICA soon evolved into an armed force dedicated to “an independent Irish socialist republic”. After Larkin fled to America when the Dublin Lockout eventually ended in 1914, Connolly began organising for national rebellion and sought allies within the Irish Republican Brotherhood and Padraig Pearse’s Irish Volunteers. And on Easter Monday of 1916, they began that doomed rebellion. During his life, James Connolly published a number of books and dozens, perhaps hundreds, of pamphlets and essays. Along with Jim Larkin he arguably created the modern Irish labour movement and unionised the workforce. While he was alive, Connolly was an inspiration to many thousands, and in death he has been an inspiration to millions. Indeed, it has been said that it was Connolly’s death, above all things, that shook the Irish people from their stupor and brought about the War of Independence that would ultimately lead to the formation Irish Republic. On the morning of May 12th 1916, with shrapnel in his chest and his ankle shattered by a bullet, Connolly was transported from a secure hospital in Dublin to Kilmainham Jail. He was carried on a stretcher from the ambulance to the courtyard, pausing briefly to allow him to meet with a priest. He is said to have confessed his sins to the priest and received communion; his first religious acts since his wedding in 1890. 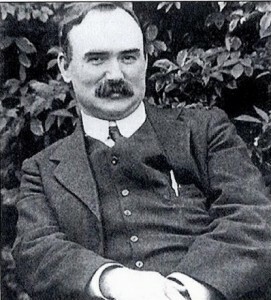 Famously, when the priest asked whether he could forgive the men who were about to shoot him, Connolly replied “I will pray for all men who do their duty according to their lights [conscience]”. He then smiled wickedly and whispered “Forgive them father, for they know not what they do”. Great piece about a truly self-taught revolutionary working class hero. I think Connolly is all the more inspiring in that – unlike some of the others in the Easter Rising – he knew that it was a ‘doomed rebellion’. But like Rosa Luxemburg in 1919 and Che Guevara in 1967, he knew that there are simply certain times when revolutionaries can’t just stand aside and analyse events – and so he went to his death with his eyes fully open. *And* Connolly welcomed women into the ICA ranks on completely equal terms. At that time he was one of the leaders and had passion still in him when he spoke.he didn’t know what he was saying.because we are not in a war we couldn’t understand want he felt. To my eye that is a very telling and educational tribute. To try and pick up the smoldering pieces? How might we best practically honor Connolly’s revolutionary legacy? Still too little known, the teason why we had to vote No is that our nats offered us a genocidal crime against our nation. Their planned citizenship rules wete actually going to make it refusable for Scots born in the diaspora and not already resident here on independence day. All through the campaign they would not answer any enquiries or meeting questions to say that the provision for the first 2 generations diaspora to apply for citizenship by descent would be unrefusable. Jim Sillars told George Galloway his son might not get it, and I saw him tell a large Yes meeting he wanted the diaspora filtered for skills the same as any other migrants. So that those who had had abusive school experiences that were not their fault wpuld be further punished for their victimhood by their own country rejecting them. What they called “civic nationalism” was a line of only caring about the already resident population here and total anti-outsider bigotry. I petitioned the European parlt, number 1448/2014, that it would break human rights on family life to accept the valid existence of, and have any dealings with, a Scottish state doing this. Irish nationalism never had a hate racism against its own diaspora like this. It built its strength from its diaspora. The famine emigtions were atill in living memory. We see here that Connolly was diaspora born, same as da Valera. Yet now the Scottish nats are proposing to commemorate the Easter Rising for their purposes!! He was a very brave man, a good example to follow. He died trying to free Ireland from british rule. In my eyes he is a hero. God bless him. mary jane wilson. Long Live The NativeAmericans/ The Irish/English !~~! died in the actual rebelion. and that Connolly was also their Hero. He died for The Whole World.